Our Roman model brings unique style and beauty to your backyard with its design-inspired wall. Khaki colored co-ordinated posts and top seats add a graceful touch. This look compliments any backyard and any taste. 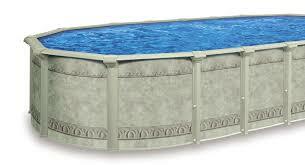 The Roman design has been around forever and has proven itself as a leader in pool design and structural strength. 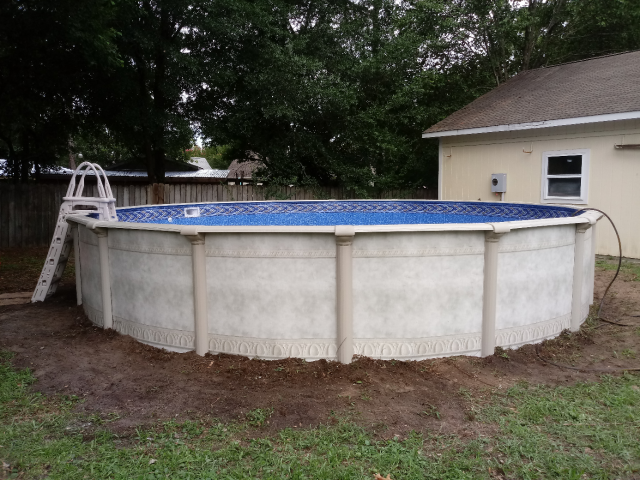 This pool stands up to whatever kids can dish out, while handling weather with ease. The roman’s 7″ resin top seats and 6″ resin vertical posts resist weather, water, and wear. The Roman’s frame consists of all resin components to resist corrosion and withstand the test of time. It’s 45 year warranty provides peace and a guarantee that the Roman will provide years and years of outstanding life and enjoyment. This kit includes the Heavy Duty 20mil Brighton Prism Beaded Liner to compliment its beautiful look and unique design. The Salt System is the greatest addition to above ground pools in ages. The system is easy and inexpensive to run, reducing your maintenance to minutes a week and your cost for chemicals to 20% of the normal chlorine usage. 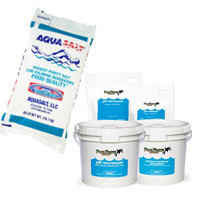 The salt system makes the water softer and healthier. Great for swimmers that are too sensitive to normal chlorine use. 7″ top seat roll-formed resin. The Aqua Staircase is the highest quality step system we have seen for above ground pools. A great feature is the ability to have one or two handrails. The system comes with two and you decide which ones to install. Steps are perfect for heavier or elderly swimmers that require easy access to the pool. Keep in mind that you will also need a deck built up to the pool for this ladder to work. Built smart, built strong, built customer friendly. There is only one step built tough and smart enough to be called the Aqua Staircase. Using rotational molding technology, the Aqua Staircase is a one piece step system manufactured from top quality PE resins. The Aqua Staircase derives its strength from its simplicity! 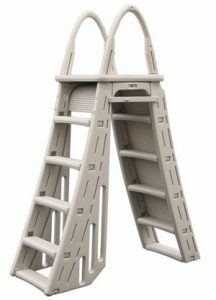 Its smooth roto-molded bottom edge makes it more liner friendly than other steps on the market. 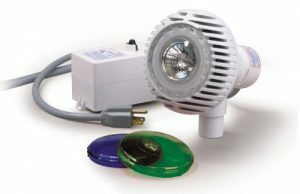 The AquaIlluminator light is the brightest above ground pool light available. This makes it perfect for any size pool. 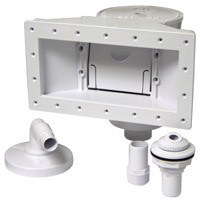 The AquaIlluminator is designed to be a light and a return from the filter system and fits into the return hole so no other holes will need to be cut into the pool wall. This allows the pool owner to have a light and keep their pool’s warranty. Our Brighton/Prism 20mil EZ Bead Liner is built to last and sparkle through the pool its whole life. The Brighton tile wall design contains a bright tile border of woven colors and shapes. The side wall and bottom of the liner sparkles with a prism gleam to shimmer in the pool and play with the sunlight. At 20 MILS the Premium Brighton Prism is almost twice as thick as the common 20 GAUGE liners. 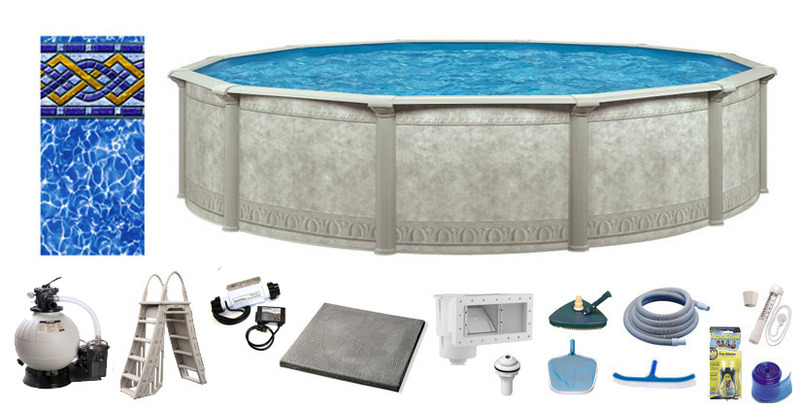 The Hayward 19″ Sand Filter System is more than adequate for any above ground pool size. The system will circulate all the water in a 24′ pool through the filter media 3 TIMES a day for a common 12 hours filtration cycle. All the filtration you need and then some! 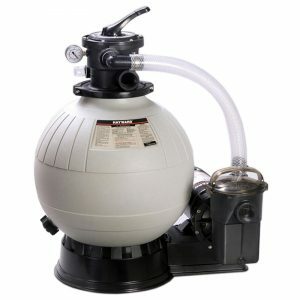 Why sand filter? 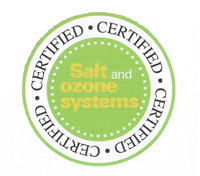 Because sand filters are the easiest and most reliable filter system made! Simply turn its handle to clean the filter on its own. Turn the handle back when its done and your finished. Easy! 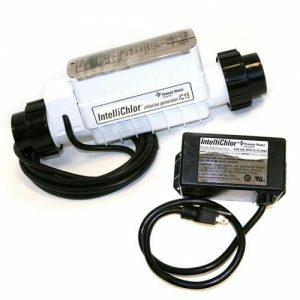 The Pentair IntelliChlor is a salt generator for above ground pools up to 15,000 gallons and the 30 is up to 30,000 gallons from one of the leading names in the industry. It may be installed either horizontally or vertically with 2 threaded couplings and is built with a clear sliding cover for easy access to diagnostic readings. The cell and control panel are combined into a single assembly for convenience, and its sealed power center mounts at the wall near the pump for hassle-free wiring setup. Its interface includes easy-to-read status updates on salt levels, cell status including power levels and flow rates, and a sanitizer output that lets you regulate salt production. It is built with titanium electrode cell blades coated with ruthenium oxide for maximum durability, and its waterproof electronics ensure safe operation. The IntelliChlor has union inlet and outlet connections designed to make cell replacement simple. The IntelliChlor comes with everything needed for installation including the external power center, salt cell, and threaded couplings. One more way to make your swimming experience that much easier! You need a way to get into and out of your new pool. You want it to last and look good for years. You want it to be tough. You want it to handle any weight it may need to handle. 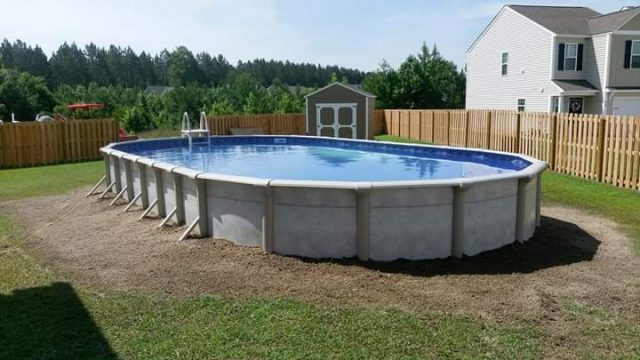 You want wide, easy access and you want to be able to keep kids out of the pool when you are not there. All these reasons are why we place the Heavy Duty A-Frame Ladder System in each package. All Resin structure gives the ladder long and beautiful life. Wide steps to easily go in and out of your pool. A cool, gray color for being there, but not standing out. We throw this item into the package to preserve the life of your investment. 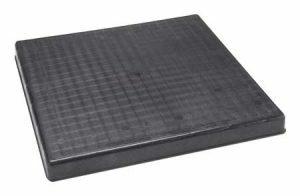 The Equipment Pad keeps the pump and filter system free from minerals in the soil and the elements. This lengthens the life of the filter system and keeps the area around the filter system easier and cleaner to maintain. 2’x3′ makes it big enough for any filter system. Thermometer: So you can check the water temperature before diving in. 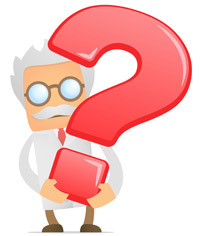 Test Kit: So you can stay on top of the water chemistry. Brush: Scrub the sides of the pool or push debris where you want it. Leaf Skimmer: Scoop the floating leaves off of the top of the water or the floating bees that threaten your skimmers. Vacuum Head: Vacuum out the debris, just in case your mother comes over. Vacuum Hose: 35 feet long to manage every pool. 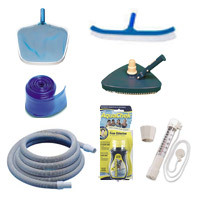 50′ Backwash Hose: Use this to route water away from the pool when the filter is cleaning itself. Water has to get from the pool to the filter system and there is no better way to do this that the extra large opening of the widemouth skimmer. Every pool needs a skimmer and return, so you might as well do it best! 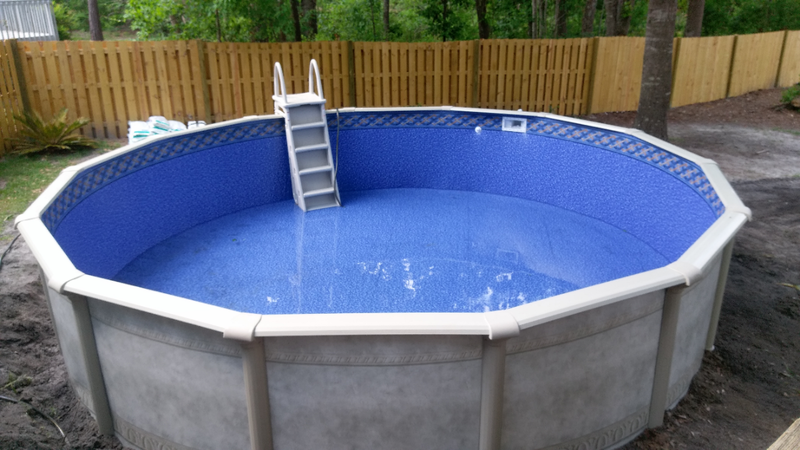 Once your pool gets filled up, we like to come out to your house and put all the salt and balance chemicals you will need for the season so that you are up and swimming and won’t have to deal with chemicals for the rest of the summer. One of our favorite things to do in the process of your new pool is to come out to your house and teach you what to do through the season. This is where everyone gets to see just how easy your new pool experience is going to be for you. This usually takes and hour or so and its shown to be the best way to get our customers on the right track and keep them there. We’d love to come out and take a look at your backyard and talk with you about your vision and needs and give you a free backyard estimate on the pool kit and installation. Copyright © Above Ground Pros Inc.